The weekend is here and it is time to start our 4th of July plans. So we here at LJ thought why don’t we do a special giveaway! 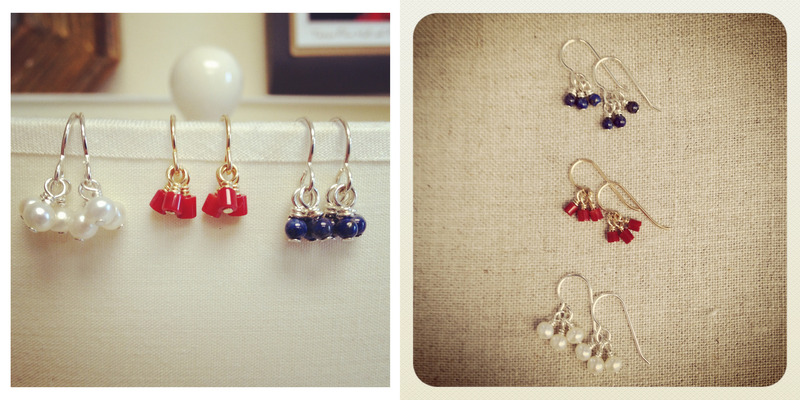 We have a red, white, and blue pair of our Katherine earrings that will go to one lucky winner. Give away a pair or two of these dainty earrings as gifts, or keep them for yourself. We will announce the winner on Tuesday’s blog so enter before it is too late! Happy weekend to you all and good luck! We are swiftly approaching the first weekend of July with 4th of July plans in the works. Starting this weekend there will be barbecues, camping trips, boat rides & beach lounging. What playful plans do you have for this celebration of our nations birthday? 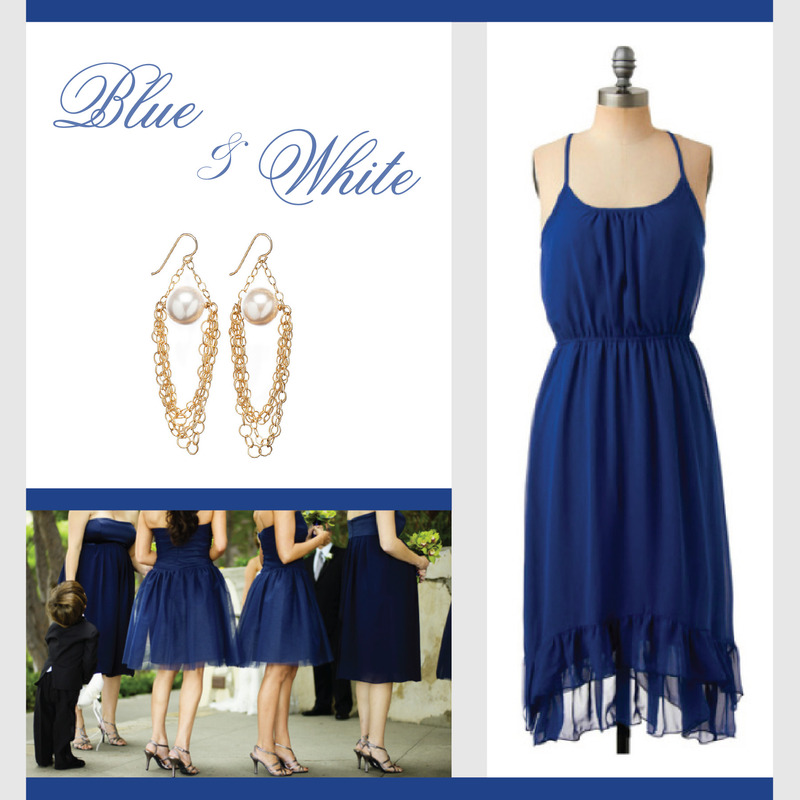 Here is a little of our favorite red, white & blues to share with you! Stir up some of your favorite drinks in some patriotic inspired glasses, or cool down poolside with a cool frozen drink and some juicy watermelon stars. One fun thing for a great snack or appetizer at your BBQ could be caprese pops. Oh and it is always great to bring some red, white & blue inspired salt & pepper shakers. Sticking to patriotic red, white, & blue find yourself a cute dress with wedges for an evening watching fireworks, or dining out with friends. Try decorating your nails to sparkle like a firecracker, and keep your jewels light and dainty in the steamy summer heat. Choose jewels with stones such as lapis, coral and pearls to bring out your American pride with style. Be sure to enjoy your holiday weekend what ever you may do… and be sure to be careful if playing with any fireworks. Shine on and happy early 4th of July! Stay tuned for next weeks blog to take part in our special 4th of July GIVEAWAY! So who ever said that ball games are just for the boys? Not us! June is a perfect time for a baseball game, and what better summer activity for the whole family to enjoy than America’s favorite pastime. And hey, who said you couldn’t look completely fabulous while sitting behind home plate with a cold one and a ball park dog? Let’s take a look at a few of MLB’s favorite teams and what LJ accessories we would choose. The reds and blues have it with the two Texas teams of course coming out on top and a couple other favorite blue and reds. Our bamboo red coral matches superbly with any red team of choice, or if you want to head to the blue side lapis is the perfect gem of choice. Our picks include the Gayle coral earrings and Jennifer coral bracelet that will bring out your sportsmanlike fury with the red, and our new Cameron lapis earrings will keep you cool in the hot summer heat with the blue. From New York to LA we have both dark and vibrant colored teams of our choice that we think gray toned jewels would compliment best. The beauty of the labradorite stone, that is seen on our earrings like the Wendy gray or Megan, is that it picks up all hues that surround it. So if worn with your Rockies purple, or Dodgers blue you will see the purple and blue hues brought out on the jewels themselves. And of course you can never go wrong with the classic pearl, even at a baseball game! The Lucy bracelet is a perfect example of a pearl that can be worn just as casual as it can be dressed up. Also this bracelet moves freely on your wrist for when you are reaching to catch that fly ball. If you are needing the perfect ball cap we have your head covered also! We have a stylish LJ trucker cap that will keep your head cool and your face protected. And don’t forget that koozie to keep your drink chilled! So what is your favorite MLB team? All the MLB women’s apparel can be found at Ladyfanatics.com. On another note, we have a winner for our June giveaway! So we are finally back in the swing of our weekend wine picks, with two picks under $10 as always. Once again we have two red wines that were taste tested today by 5 of us along with cheese, crackers, grapes, salami, and some yummy cream cheese chocolate wontons. Sorry to all of you white wine lovers, we will try to mix it up for you next time around. Today our wine was brought by the lovely Jana, accompanied by the food gloriously presented by the fabulous MK. Black Opal, a 2009 Cabernet Sauvignon from south eastern Australia. This red wine has a smooth fine flavor full of finesse and character. It carries a sweet, rich aroma of blackcurrant, mint and spice highlighting the very best of full-flavored Australian wine. This smooth wine pairs well with red meats or veggies, but we found it was very tasty with our cheese and grapes. This bottle retails at around $7 – $10. Robert Mondavi Merlot is a 2010 red wine from the north coast of California. This full-bodied red is very rich in flavor with almost a spanish type kick to it. Before unveiling the guess was that this was possible an Italian or Spanish wine. Although to the groups surprise it was right from our California vineyards. This wine has velvety layers of berry, plum and spice. This wine pairs well with meats as well especially of the grilled selection. This bottle retails at around $6 – $8. The winner of our taste test by a unanimous vote is…. Black Opal! Hope you all have a great weekend! If you need a great, cheap selection of wine this pick up Black Opal. 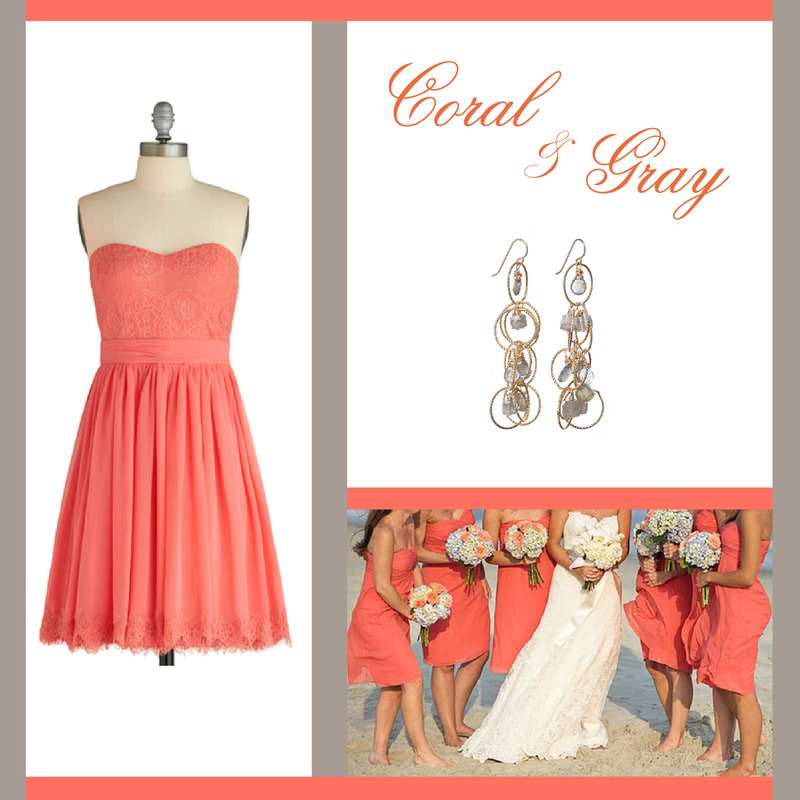 Also don’t forget to enter our Gayle coral earring giveaway, go to our Sail Away… Giveaway blog for how you can enter to win. 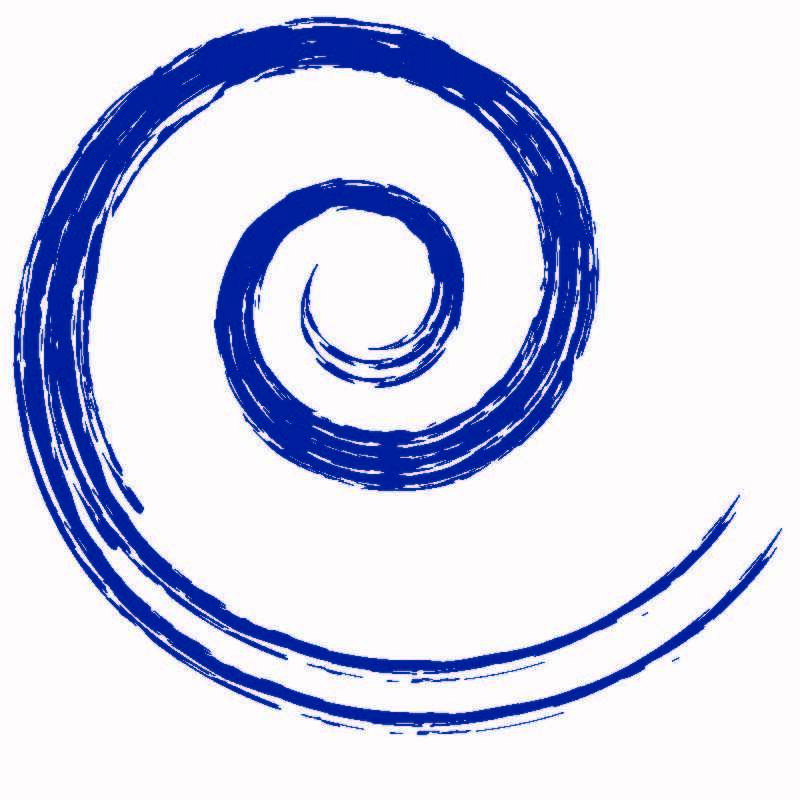 Sail Away… and a Giveaway! 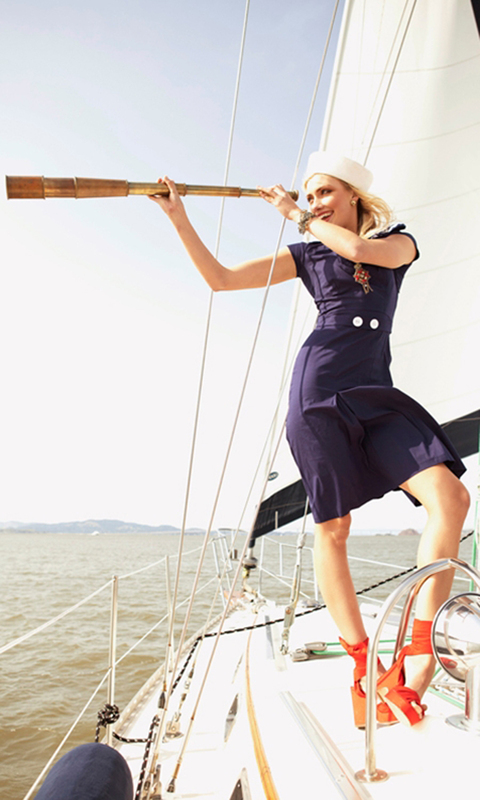 Today we are setting sail off into summer with our favorite nautical styles. 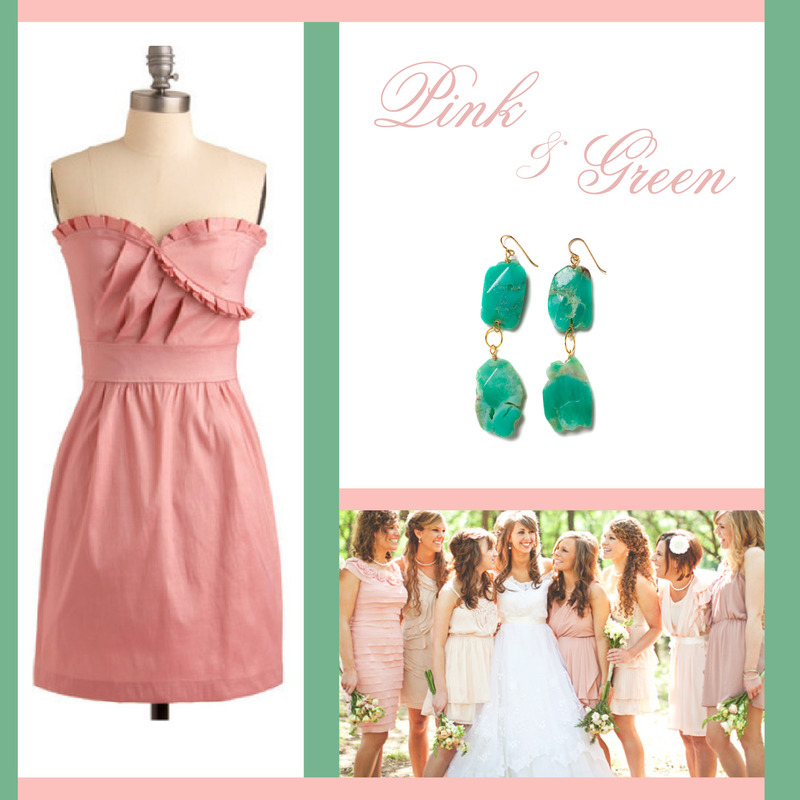 We also have a special giveaway for one lucky winner – our Gayle coral earrings! We are bringing out our reds, whites, and navy blues to make up the perfect nautical style, and layering them with our favorite LJ jewels. 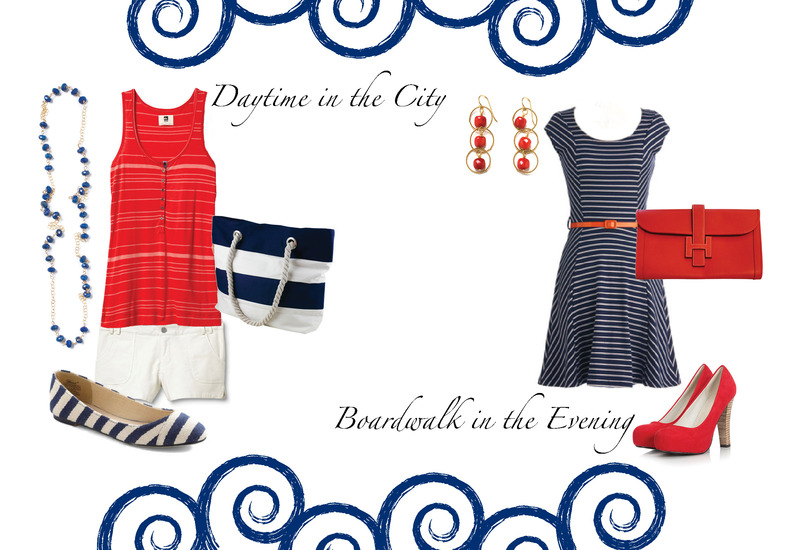 If you are taking to the sea this summer, or just out for a day trip in the city you can find the nautical themed attire that works best for you. Stripes have come back with vengeance this summer and can be seen in all shapes, sizes and bright bold colors. One true stripe staple though, is the traditional navy and white. These stripes pair best with your whites or reds giving you that oh-so-glam sailor look that will whisk you away on a high seas adventure… even if only in your daydreams. Dress it down casual by day with a tank, shorts and some cute flats to ride smoothly out on the water, or to stroll around the city. And for the night grab your pumps with your navy and white stripes and all of the red accessories to boot for a sassy splash of color paired with a traditional, classy style. Finally we get to our GIVEAWAY! We are giving away a pair of our gorgeous red coral Gayle earrings to one lucky winner to add to their sizzling summer wardrobe. 2. Leave a comment about an adventure you plan to go on this summer. The winner will be chosen on Monday June 11th so get your entry in before then, and we will announce it on next weeks blog! GOOD LUCK! And Happy Sailing!